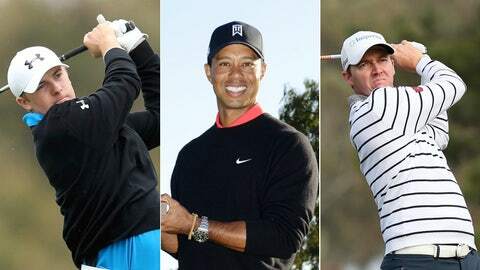 Jordan Spieth (left), Tiger Woods (center), and Jimmy Walker (right) could each be in the hunt at Torrey Pines. Tiger Woods’ season is set to officially begin at 10:40 a.m. PT on Thursday, when he is scheduled to tee off in the opening round of the Farmers Insurance Open at Torrey Pines, just outside San Diego. Paired with 20-year-old Jordan Spieth and current FedEx Cup points leader Jimmy Walker, Woods looks to become the first player in PGA Tour history to win at the same course nine times (Farmers: 1999, ’03, ’05-’08, ’13; U.S. Open 2008). A win would also tie Woods with three others to win one PGA Tour event eight times: Sam Snead at the Greater Greensboro Open, himself at the Arnold Palmer Invitational, and himself again at the WGC-Bridgestone Invitational. Though a Woods’ win is far from a foregone conclusion. In fact, Woods finishing third within his own group is hardly out of the question — Spieth and Walker have clearly proven they should not be overlooked this week. Spieth, who began his professional career at Torrey Pines last year, turned in a rookie season for the ages. At 19 years old, he became the first teenager to win a Tour event in 82 years after outlasting Zach Johnson and David Hearn in a three-way playoff at the John Deere Classic – something Woods never did. Spieth folded that win into a year featuring a staggering nine top-10 finishes and easily ran away with the Rookie of the Year Honors; an honor he received alongside Woods’ Player of the Year award. Walker, on the other hand, is no spring chicken. But at 35, he is playing the best golf of his career. He turned pro in 2001, yet only has two wins to his name. Those two wins, however, have both come over the last four months — in October at the Frys.com Open and in January at the Sony Open in Hawaii. Walker has fared well the last couple times he’s teed it up at Torrey Pines, finishing T-8 in 2012 and T-4 in 2013. That’s not quite the track record of Woods, but he is trending in the right direction. Spieth was cut in his pro debut last year, but has definitely come a long way since. Besides being in the same grouping, the common thread weaving these three together is that they are all expecting to have career years: Walker has his locked up; Spieth has already notched a runner-up finish this season at the Hyundai Tournament of Champions and will no doubt build on his strong first year; and Woods can’t possibly go another season without winning a major — can he? "All I know is that I’m still in, I feel, my peak years," he told FOX Sports’ Robert Lusetich on Wednesday. "I’m still playing well. There have been a number of guys who have gone on even in their early 40s to win major championships. Mark (O’Meara) did it; he’s the oldest one to do it, to win multiples in the same year. Jack won in his 40s, (Ben) Hogan won multiples in his 40s, actually 38 and above." Woods is the clear favorite, but look for all three to make it to the weekend . . . and don’t be shocked if Spieth and Walker are in the thick of it with Woods on Sunday. That 10:40 tee time is of course barring any famed Torrey Pines fog delays; though if last year’s impromptu mascot dance competition is any indication, a fog delay is not such a bad thing. 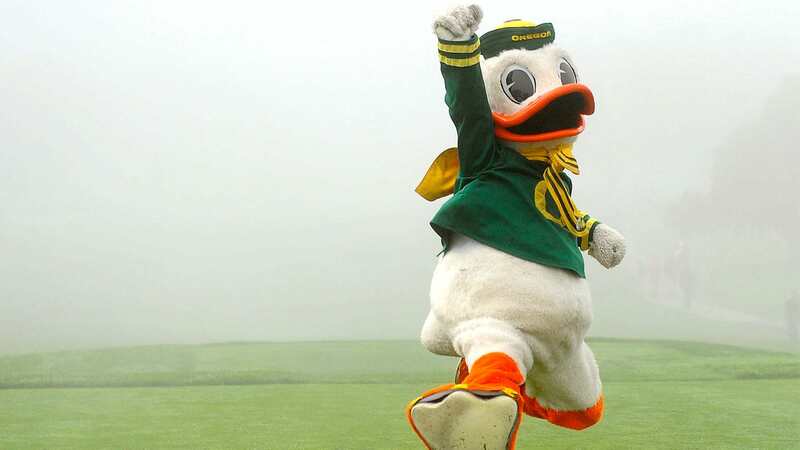 Look for Puddles the Oregon Duck to repeat as champion of the damn world . . .